News media are welcome to download and reproduce the following images in the context of explaining neuromodulation therapies to the public. Photo credits are required where indicated, and some links to sources provided. Caption: This CT scan image depicts closed-loop responsive neurostimulation, which is undergoing clinical trials for halting seizure activity in epilepsy. Caption: Dr. Chima Oluigbo, center, at a neuromodulation training session for physicians in 2012. Caption: Fluoroscopic imaging guidance for spinal cord stimulation procedure. Credit: Image courtesy Annu Navani, M.D. Caption: Sacral nerve stimulation procedure. Credit: Image courtesy Magdy Hassouna, M.D., Ph.D.
Caption: International Neuromodulation Society member Dr. Peter Staats, an interventional pain specialist, inserts the lead of a spinal cord stimulation system along the spine of a chronic pain patient. 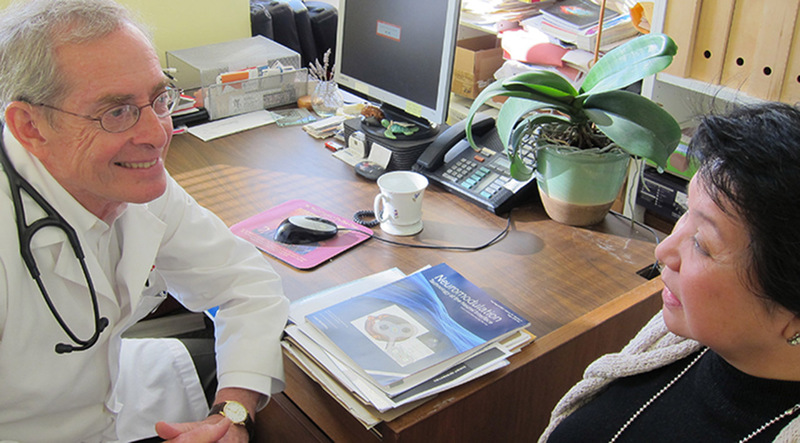 Caption: Dr. Elliot Krames speaks with a patient at the Pacific Pain Treatment Center he founded in San Francisco. 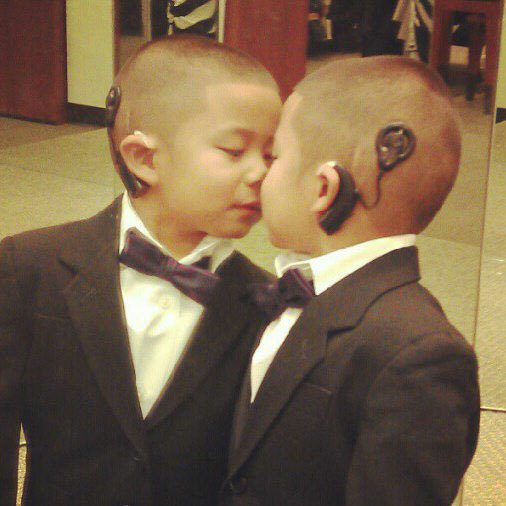 Caption: Cochlear implants were an early application of neuromodulation. Caption: A demonstration pulse generator (left) and stimulation lead (right) are displayed in a clinical examination room. Caption: International Neuromodulation Society Nordic Chapter Chairman Kaare Meier, M.D., Ph.D., of the Department of Neurosurgery, Aarhus University Hospital, Denmark, presents rechargeable implantable impulse generators that may be used in spinal cord stimulation. Caption: Torpedo panthera (leopard torpedo) in the Gulf of Aqaba, Egypt - a type of torpedo ray. The first described neuromodulation treatment for pain (by the Roman physician Scribonius Largus in 46 AD) was based on the electrical properties of the torpedo ray. Caption: A selection of paddle leads available in 2015. A €2 coin and a US quarter are shown for comparison. Caption: A selection of percutaneous leads available in 2015. A €2 coin and a US quarter are shown for comparison. Caption: A selection of percutaneous lead delivery devices available in 2015. A €2 coin and a US quarter are shown for comparison. Caption: A selection of lead anchoring devices available in 2015. A €2 coin and a US quarter are shown for comparison. Caption: At the Center for Ambulatory Surgery at Aarhus University Hospital, Denmark, tools await use by Dr. Kaare Meier and Prof. Jens Christian Sørensen, who implanted a spinal cord stimulation system to help manage a patient's chronic, bilateral lower extremity pain caused by failed back surgery syndrome. On the tray are scalpels, scissors, bipolar, retractor, local analgesic, and a loss-of-resistance syringe. Written permission has been obtained from the patient. The picture series by Dariusz Orlowski, Ph.D. is not intended to serve as endorsement of particular products or manufacturers and is published for educational purposes only. Caption: Entry into the epidural space is planned using imaging as shown here, and is selected based on the expected final position of the lead (there must be some space to maneuver) and with respect to existing pathology. Caption: Under local anesthesia, a Tuohy needle is inserted at an angle in preparation for introducing the percutaneous stimulation lead into the epidural space. Caption: When the needle is in the epidural space, a soft guidewire is inserted under fluoroscopic guidance. Caption: The introducer is inserted over the guidewire. Caption: The hybrid lead is inserted through the introducer. Caption: The lead can be steered in the epidural space using a curved stylet inside the lead. Caption: This fluoroscopy image shows the lead placed in the midline inside the epidural space. The tip (contact #1) is at the level of the intervertebral disc Th11/Th12. Caption: The lead contacts can be programmed individually using a programming device Generally, the aim is to achieve a soft, buzzing sensation (paresthesias) in the entire pain-afflicted area, using a combination of lead (re-)placement and careful programming. Communication with the patient is essential during this stage. Caption: The implanters pause for a moment of contemplation. Caption: If necessary, a second lead can be inserted through the introducer. This fluoroscopy image shows the second lead placed just to the right of the first. Caption: Reference image of the cortical surface of the brain is used for studies about brain organization changes noticed in studies of deafness and language acquisition at the Brain Development Lab, University of Oregon. Credit: Image courtesy Mark Dow, University of Oregon. Click on image to download a larger image. Credit: Image courtesy National Institute of Mental Health. Caption: Surface mapping of brain image for research. Click on image to download a larger (rectangular) image. 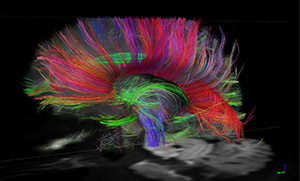 Caption: Diffusion Spectrum MRI (DSI) of the human brain obtained with the MGH-UCLA Human “Connectom” Scanner acquired in 8 min. Where images of this quality were previously obtained in scans of 1 hr or longer, improved scanner performance coupled with innovations in RF coil design, MRI scanning physics, and mathematics of diffusion MRI reconstruction have reduced the total scan time by 6-fold or more (here from 48 min to 8 min). Most of these innovations will be readily transferable to most or all general-purpose MRI systems, and make possible practical high-resolution diffusion MRI on a routine basis (courtesy Laurence Wald, Van Wedeen). The fiber tracks are color-coded by direction: red=left-right, green=anterior-posterior, blue=through brain stem. Caption: A sagittal magnetic resonance image (MRI) of the brain. National Science Foundation (NSF)-supported fundamental research led to the development of MRI technology. Credit: Courtesy FONAR Corporation (via NSF). Click on image to download a high-resolution TIFF image. Caption: Enlargement shows a 3-D electrode array, at the right edge of this coin, which is part of a visual aid and will be used to electrically stimulate the cortex. Caption: Cells fluoresce in optogenetics research. Caption: Electron micrograph of human neurons. Caption: Scanning electron micrograph of a nerve ending shows orange and blue vesicles containing chemical messengers about to be released. Caption: An imaging study used magnetic resonance imaging (MRI) to detect deterioration of white matter tracts in the brains of older adults at high risk for Alzheimer's disease. The data suggest that changes in white matter connections may be among the earliest brain changes in Alzheimer's disease, which may prove important for early detection by noninvasive imaging. (Early stage Alzheimer's disease has been subject to preliminary clinical trials of deep brain stimulation as a potential means to slow the progression of memory loss). Credit: Brian T. Gold, Department of Anatomy and Neurobiology, University of Kentucky (via NSF). Click on image to download a a high-resolution TIFF image.